Ellen Pao, Former Reddit CEO, Drops Appeal In Gender-Bias Suit Against Kleiner Perkins : The Two-Way In a statement, Pao says the odds, both in the corporate world and in the courts, are stacked against those who allege discrimination. 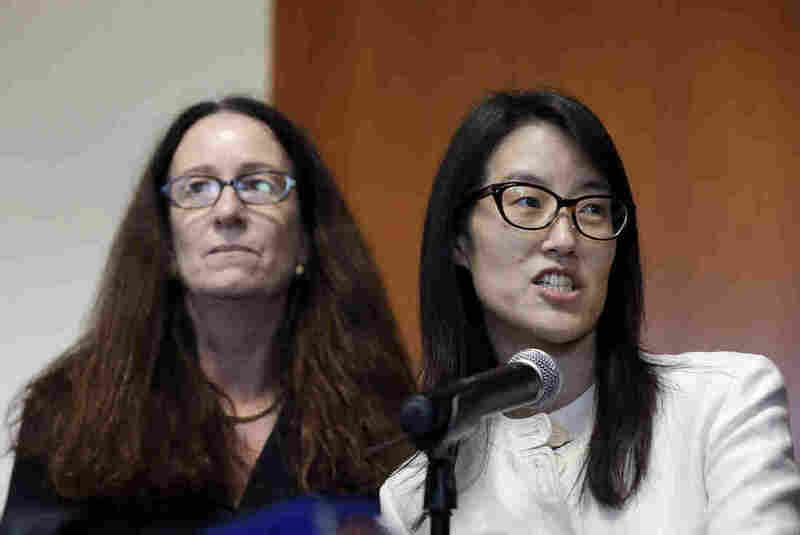 In dropping her appeal, Pao will pay Kleiner Perkins' legal fees. Ellen Pao, right, gives a statement to reporters next to her attorney Therese Lawless at in March, after a jury decided that a prestigious venture capital firm did not discriminate or retaliate against her. Ellen Pao, the former Reddit CEO who has been embroiled in a high-profile discrimination lawsuit against former employer Kleiner Perkins Caufield and Byers, says she will pay Kleiner's legal fees and drop her appeal. "I am now moving on," she wrote in an op-ed on the tech site Re/Code. "My experience shows how difficult it is to address discrimination through the court system." As we reported, a jury ruled back in May that Kleiner Perkins did not discriminate against her because of her gender, nor did the venture capital firm deny her a promotion because she was a woman. Pao had sued her former employer for $16 million in damages. -- In the corporate world, companies are ill-equipped to handle these cases. She writes: "Human resources is a company-oriented function — when you can find it at all." -- In the California court system, the burden of proof is outstanding. She writes: "To win in California court, discrimination has to be intentional and a substantial motivating factor for different treatment. This standard is vague and hard to prove; there could also be other factors like racial or age discrimination, personal animus or unconscious biases. These all add up to excuses that can prevent a finding of discrimination or retaliation." -- How difficult the fight would be was evident even in jury selection. She writes: "From the first day of trial, I saw how hard it was going to be to win when every potential juror who expressed a belief that sexism exists in tech — a belief that is widely recognized and documented — was not allowed to serve on the jury." -- Kleiner Perkins has "deep pockets." For example, she writes: "Kleiner had three times as many lawyers and paralegals working at any given time that we knew of. They also had full-time jury consultants observing most if not all of the trial"
In a statement obtained by Bloomberg, Pao said she was "gratified that my actions have encouraged others to speak up about discrimination in venture capital and technology more broadly." She added: "I am encouraged that companies are taking more action to quantify and address the disparity of opportunities for women and minorities." Bloomberg notes that Kleiner's court costs total $276,000.